The East Pacific Rise (EPR) at 9°50’N, one of the fastest spreading centers on Earth, is a highly dynamic magmatic, hydrothermal, and biological system that presents an ideal opportunity to observe and measure changes in and linkages between surface and sub-surface mid-ocean ridge processes on decadal time-scales. Two volcanic eruptions have now been observed at the site, in 1991 and most recently 2005-2006. Hydrothermal activity is prolific at the EPR 9°50’N area including both focused high temperature vents and areas of diffuse flow. A substantial collection of time-series measurements now exist that describe the evolution of the vents and associated biological communities since the 1991 eruption and now through the 2005/2006 eruption. In Summer 2008 we conducted the first multi-streamer 3D seismic reflection experiment of the new national seismic imaging facility, the R/V Marcus G. Langseth, focussed on the EPR at 9°50’ N. The primary goals of expedition MGL0812 were to use this multi-streamer capability to create an accurate 3D seismic reflection image of the magmatic-hydrothermal system within the East Pacific Rise 9°50’N site by imaging the structure of the axial magma chamber (AMC) lid and shallow oceanic crust at a resolution, geometric accuracy, and scale comparable to seafloor observations of hydrothermal, biological, and volcanic activity. 3D migration techniques will allow us to construct geometrically accurate high-resolution images of the magma system and its distribution in the subsurface, while 3D amplitude variation with offset (AVO) analysis will allow us to determine the seismic properties (e.g., velocity, density, Poisson’s ratio) that are proxies for the porosity and fluid content of the magma body. The 6 km offset of the hydrophone streamers will permit a detailed 3D characterization of the thickness and velocity of seismic Layer 2A and the upper part of Layer 2B. By providing 3D images and physical property mapping at a resolution comparable to the scale of variation of surface phenomenon, we can address several major questions at the EPR site that focus on the relationships and interactions between sub-surface and surface processes. The 3D volume will also allows us to address the structure of the lower crust, the Moho transition zone, and uppermost mantle with unprecedented detail. Furthermore, our 3D seismic study will establish a baseline image of the magma body and upper crust against which changes in geometry and physical properties can be detected in the future using 4D time-lapse seismic imaging. Figure above shows the track coverage achieved during our experiment. 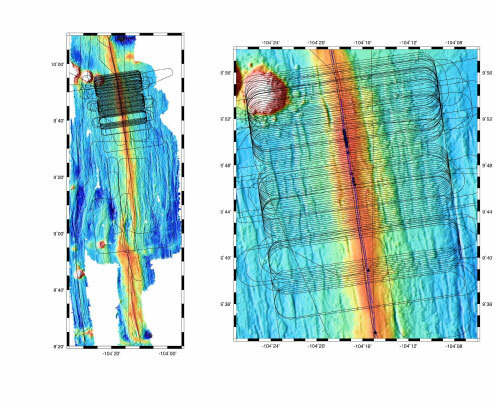 Our planned survey included a primary 3D box of 142 lines spanning the ridge axis from 9°57’ to 9°34’N and 3 axis parallel lines designed for dedicated AVO studies of magma lens properties. The 3D box was positioned to provide full coverage of the region that erupted in 2005-06 and 1991, extending from the northern end of the 2005/06 lava flows at 9°57’N to the presumed southern limit of diking at 9°39’N. The southern end of the planned survey at 9°34’ was designed to capture the prominent discontinuity of the ridge at 9°36’-38’ and a portion of the adjoining segment. The three axis-parallel lines included one primary line extending the full length of the ridge axis from Siqueiros to Clipperton Fracture Zones and two shorter parallel lines from 10°05 to 9°20’N. These shorter lines were spaced 300 m from the main axis line to provide an ~ 900 m wide swath of 24 CDP lines spanning the entire width of the AMC in this region (500-700 m based on the 1985 Conrad study) in order to facilitate AVO studies across the melt lens. The primary axis line was designed to provide coverage of the unsurveyed segment south of the 9°03’N OSC (the southern limit of the 1985 Conrad survey was ~8°50’N) and to transect the 3D MCS ARAD study at the OSC in order to facilitate comparison and assess possible change in magma lens structure and seismic properties. Within the 3D box, planned sail lines were spaced 300 m apart. With streamer separation of 150 m and two gun string sources fired alternately on distance at 37.5 m intervals, this configuration provides eight 37.5 m spaced CMP lines with each pass and a 37.5 m by 6.25 m static bin cell size. Sail lines were 24 km long to provide full fold coverage for the central 16 km about the ridge axis with 4 km on each end of the line for run-in and run-out and to ensure accurate streamer positioning. 4 km pull through after the last full-fold shot point was needed to ensure that the streamers to the mid-section acoustics would be through the turn and straight enough in order to be able to accurately position the streamers to the desired specifications of <3 m for receiver locations. The survey was split into 3 racetracks designed to cover the desired survey region with the seam pass of each racetrack located away from primary survey targets. The racetracks were also designed to shoot the highest priority vent region from 9°51’ to 9°46’ spanning two racetracks but in a consistent direction (east to west). The nominal minimum turning radius was 5000 m. However, during operations slightly larger turning radius was needed to maintain tension on the streamer cables at acceptable levels. In all, the cruise accomplished the acquisition of ~3,782 km of sail line data representing ~ 80% of the planned survey. With eight CMP profiles acquired with each sail line, total CMP line acquisition is 30,255.60 km. The achieved coverage includes a total of 111 across axis primary lines of the planned 3D grid collected in two complete and one incomplete racetracks as shown in the track figure above. In addition to the primary lines, we acquired 10 repeated lines for system failures and marine wildlife and 14 infill lines to obtain uniform fold. The project is being conducted as a joint collaboration between researchers at LDEO (John Mutter, Suzanne Carbotte, Helene Carton), Pablo Canales at WHOI, and Mladen Nedimovic at Dalhousie University.